Q: How do I login to the website as a coach? A: Logging in as a coach is now no different than logging in as a parent. Click on the LOG IN link in the upper right corner of the screen and enter the email address and password you used at registration to log in. Q: How do I go to my team's webpage? A: To navigate to your team's webpage as a coach, you must first login as the coach. Once logged in, click on the Team button on the top of the screen. 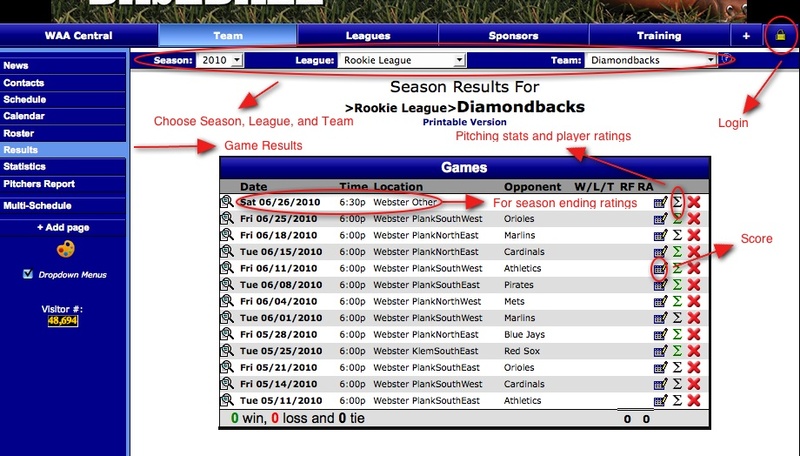 Make sure that the Season, League, and Team fields at the top of the screen are filled out with the proper information. Once this is complete, you should be on your team's webpage. Note: Often the website will remember the last team you were looking at, so sometimes these fields may be filled out appropriately right away. Q: What can I do on my team's webpage as a coach? Post team new bulletins about whatever you want related to your team, including posting your teams snack list, details about a bowling night, etc. Q: How do I enter game results like the score and the pitch count? To enter the game score (for AA and up), click on the little pencil and paper icon and enter the game score on the following page. To enter pitch counts (for Rookie and up), click on the backwards "E" to the right of the game for which you are entering and enter you pitch counts in the Pitching tab. Q: How do I enter season ending player ratings? To enter season ending player ratings (for Developmental and up), find the last "game" of the season (the Location of the "game" should be "Webster Other") and click on the backwards "E" next to that game. Enter the League Rating (1-5 with 1 being excellent, 2 being above average, 3 is average, etc.)) and the Team Rating (1-12 with 1 being the best player in the category, 2 being the second best player, etc.) on the appropriate tabs.